Because St. Augustine Church belongs to the Deanery that includes St. Mary Magdalen Parish in Berkeley, and its School School of the Madeleine, the children of St. Augustine parishioners have access to an excellent K-8 Catholic education at the School of the Madeleine. The mission of the School of the Madeleine is to inspire students to grow as educated, morally informed individuals. In the tradition of Catholic education we believe that every child is exceptional, and our goal is to help students grow into lifelong learners and compassionate leaders. The Madeleine is known for outstanding academics, including in-school Spanish and Music programs, all in the context of a Catholic education. The Madeleine is also proud of its wonderful after-school program which runs until 6:00 p.m. daily. In addition to supervised care and homework time, many after-school activities, including drama, band, and chess club, are available. The school has a wonderful and active parent community. The School extends admission to children of members of St. Augustine Parish ahead of admission to children of non-parishioners of St. Mary Magdalen’s. St. Augustine parishioners pay “in-parish” tuition instead of non-parish tuition – about a 12% savings! 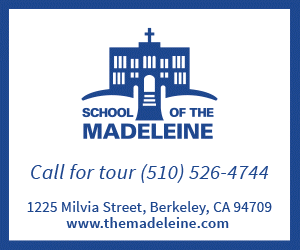 To learn more about the School of the Madeleine, please visit www.themadeleine.com. If you wish to speak to St. Augustine parishioners whose children attend the Madeleine, please contact the St. Augustine Parish Office (510) 653-8631 or St. Augustine Parish for a referral. If you would like further information about admissions, please contact Mary Schweska, registrar of the Madeleine, or Conan Graham, Vice Principal. Or, simply watch the video below.